With greenhouses becoming more and more popular each year, today there are more options in greenhouse coverings than ever before. The most common options available are Solexx twin-wall covering, twin-walled polycarbonate, single-walled polycarbonate and polyfilm plastic greenhouse covering. Each greenhouse covering material has its own advantages, so it is important to consider your particular situation before making a decision. By weighing the following factors, you should be able to choose the greenhouse covering that will best suit your needs. Plants respond best to diffused light. If you’re looking for the greenhouse covering that will give you the best, most dynamic plant growth, you should consider Solexx greenhouse covering. Solexx greenhouse covering provides 100% light diffusion which has been shown to accelerate plant growth up to 25%. Other greenhouse coverings provide little to no light diffusion, which increases chances for burning and can cause the greenhouse to overheat. If you live in a cool climate, greenhouse insulation is very important. In order to provide good insulation, the greenhouse plastic must be twin-walled. Because of this, twin-walled Solexx and polycarbonate greenhouse covering make good materials for people concerned with both cold weather and substantial snow loads. However, if you live in a warmer climate, it is important to ensure that your greenhouse covering prevents burning from intensely concentrated light. Light diffusion is crucial to preventing plant sun burn and keeping your greenhouse cooler in the summer. If you are hoping to grow during the summer months, avoid glass and single-walled or twin-walled polycarbonate, which easily overheat. The table below lists the R-value (insulation rating) for various greenhouse covering types. The higher the R value, the lower your heating and cooling costs. *Independent testing, 3.5mm Solexx with caulked flutes. 5mm results coming soon! Replacing a greenhouse covering can be a hassle, so it is important to choose something long-lasting. Polycarbonate, typically the most expensive greenhouse covering, has a warranty period anywhere from three to ten years, depending on the manufacturer (quality can vary greatly). Although it is quite long-lasting, it can be difficult to replace because polycarbonate sheets come in limited sizes and are not easily cut. Therefore, you may be unable to find polycarbonate replacement sheets suitable for your particular greenhouse. Solexx greenhouse covering, on the other hand, carries a ten year warranty, is customizable and easily replaced, as well as less expensive. Polyfilm plastic is a common greenhouse covering for people covering large greenhouses that are only being used seasonally. Although it is relatively inexpensive, it needs replaced yearly to every few seasons and is tears easily in wind and hail. Which greenhouses feature these coverings? 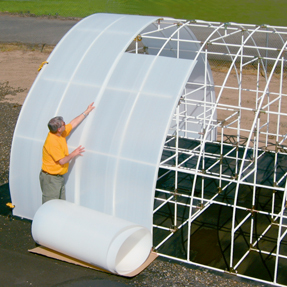 Solexx greenhouse covering – Solexx greenhouses. You can buy the greenhouse panels individually as well. Twin-walled Polycarbonate greenhouse covering – Sunshine and Hall's greenhouses. Single-walled Polycarbonate greenhouse covering – Snap and Grow greenhouse.